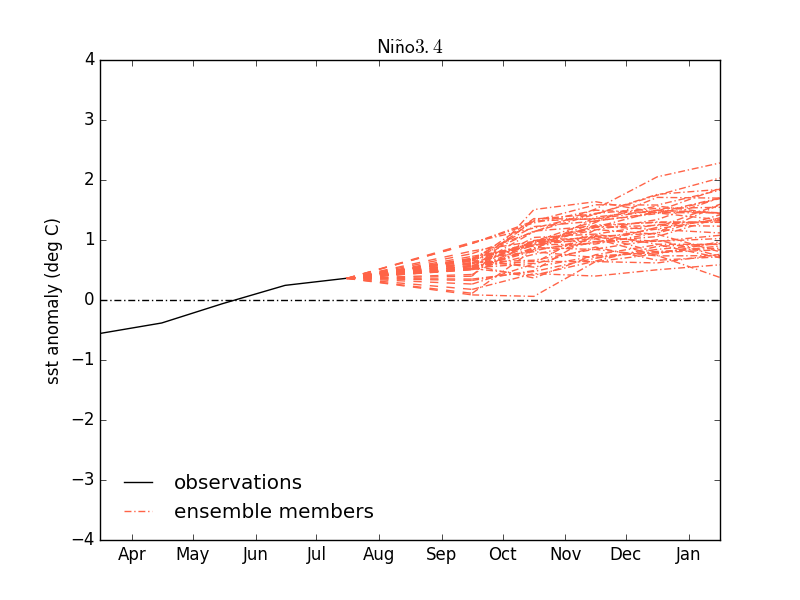 As the doors have been closed on ENSO 2017/18 with it officially being a weak La Niña season, it's time to move onto ENSO 2018/19! Given how last year evolved, I thought I'd hold off on making a new ENSO thread for a bit. If you do not know what happened last year, 2016/17 was a very weak La Niña season (weaker than 2017/18) beginning in July 2016 and already gone by late 2016 with ENSO neutral occurring in early 2017. The waters started to warm up with some significant warmer than average SSTs developing in the eastern side of the equatorial Pacific in Spring 2017. It was looking increasingly likely that an El Niño was in the works for 2017/18. The SOI for June 2017 was very negative with an index of -10.4, the most negative the SOI was since April 2016 at this time. A negative SOI is reflective of El Niño whilst positive is La Niña. The models, especially the CFSv2, was pinpointing at a moderate to strong El Niño for 2017/18 as a result. 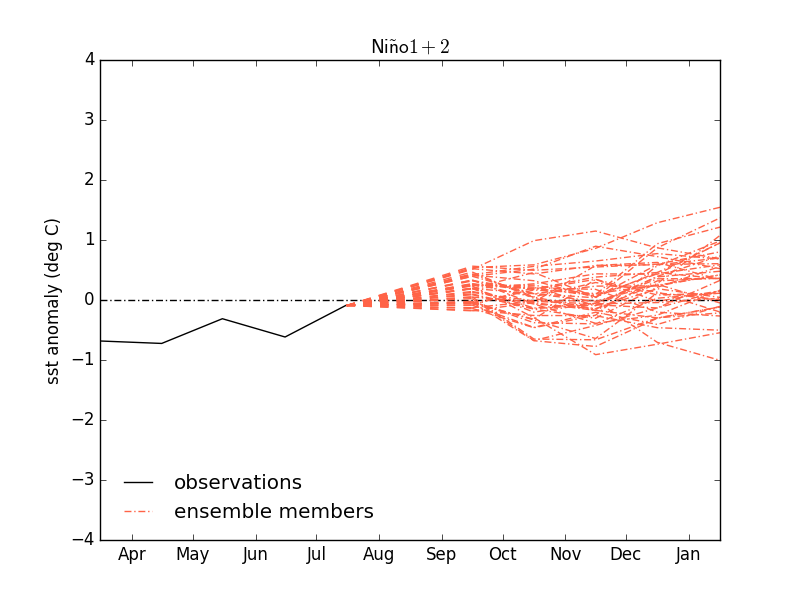 There were even a good few ensembles going for a very strong El Niño, just 2 years after the previous one (a very strong El Niño has occurred in only 1877-78, 1982-83, 1997-98 and 2015-16). However, a dramatic turn around occurred in July 2017 with the SOI going positive at 8.1. Not to mention, the equatorial Pacific waters cooled down a lot from Spring and June. Every month from July to November 2017 had a positive SOI whilst December went negative meaning the La Niña that was going to take place wasn't going to be particularly strong but it was stronger at least than 2016/17 which had a pathetically weak La Niña. Now with that behind us, let's get onto 2018/19. Here is the latest SST profile from NOAA for the 24th May 2018. I have highlighted the region we're interested in, the equatorial Pacific. The La Niña signature is well and truly gone with the warm waters overtaking it. For the central part of the Pacific (ENSO region 3.4), the CFSv2 right now is depicting a weak El Niño for 2018/19. However, if we look towards the eastern side of the Pacific (ENSO region 1+2), the CFSv2 is showing ENSO to be neutral for 2018/19. When you have the origins of an El Niño occurring in the central part of the Pacific, it's called El Niño Modoki. This is a rare form of El Niño where the warming is focused on ENSO region 3.4 in the equatorial Pacific - usually you see warmings beginning in the eastern part of the Pacific. Here's a diagram showing the ENSO regions. El Niño Modoki events tend to be favourable historically for blocked Winters in Europe. The last El Niño Modoki event occurred in 2009-10. It has also occurred in 1979-80, 1986-87, 1990-91, 1991-92, 1992-93, 1994-95, 2002-03 and 2004-05. If this El Niño Modoki outlook continues up to the latter part of this year, it will make for some very interesting discussion on the coming Winter. Anyway, let's not worry about that for now. The warm subsurface temperature anomalies are still there in the Pacific so El Niño is quite likely at this rate. Will it be Modoki? We'll have to see. Not much change in terms of the SST profile of the equatorial Pacific since the last update. The waters are slowly warming up. The CFSv2 has upgraded the chances of a weak to borderline moderate El Nino for 2018/19. Though it shows some warming reaching the El Nino threshold at regions 1+2 at the end of the ensemble, it does not look like it will reach a total of 5 tri-monthly periods, not to mention, it's well out into the end of the year and the start of 2019. Therefore, the outlook for El Nino Modoki is still there. The Jamstec is similar to the CFSv2. The ECM is also similar amazingly enough. El Nino is still on the cards but perhaps less of a Modoki event. La Nina is well and truly over, no cold SSTs shown in the equatorial Pacific or ENSO regions though there is still quite cold pool just off the coast of southwestern South America. This cold pool is making it difficult for El Nino to take over the El Nino Southern Oscillation. The warm SSTs are more focused on ENSO region 3.4 which is the sign of El Nino Modoki whilst ENSO region 1+2 is on the rather cool side (though at this moment, not exceptionally so). Let's compare to this time in 2009 when the last El Nino Modoki was recorded. 2009 did not have that cold pool near South America and the warming at that point was in the eastern equatorial Pacific. This clearly shows that there is plenty of time for changes. The model shows ENSO regions 1+2 reaching El Nino status by the very end of 2018 but until then, ENSO neutral conditions. The El Nino status is in the unreliable timeframe. 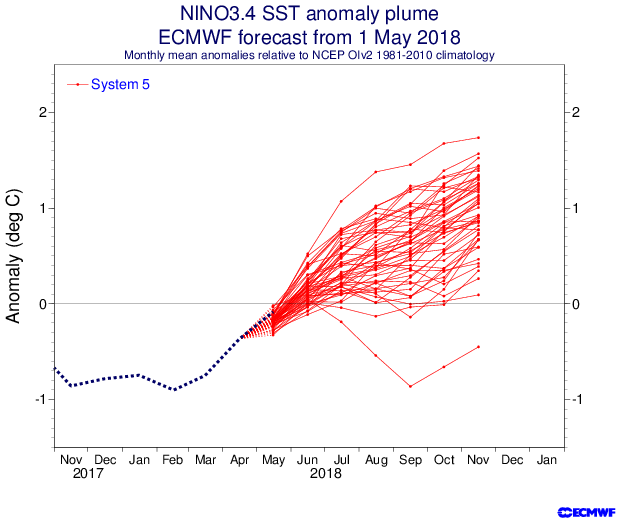 The models shows ENSO region 3.4 reaching El Nino status through this month, July, and reaching moderate El Nino status by the end of 2018. Previously it was looking like a weak El Nino so this is new. This would fit 2009 nicely because not only was 2009 a moderate El Nino, it was also El Nino Modoki. A new study shows there is some sort of connection between solar minimum and ENSO since the 1960s decade, see below. 2018-19 expected to have an El Nino will continue this "connection" or coincidence. Sryan if an el nino did happen what influence would that have on our winter,would it mean cold and dry or wet and windy? The problem with ENSO is that its effects on Europe (not just Ireland) are unknown and vary from year to year along with each strength of the different types of ENSO events. However, I have found that strong El Ninos tend to be followed by cold Aprils. 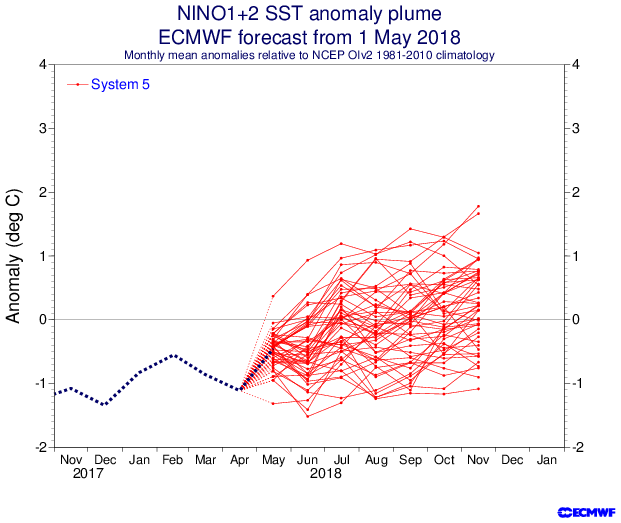 In fact, the top 6 strongest known El Ninos on record were followed by cold Aprils including 2015/16 - April 2016 was a cold month though this could also be partly blamed on the SSW event of March that year. Could be a coincidence more than anything for all we know. - Weak El Ninos tend to be mixed for Winter. Some are cold, some are mild. Example of a cold weak El Nino is 1977-78. Example of a mild weak El Nino is 2006-07. - Moderate El Ninos tend to be anticyclonic in Winter and if the block ends up in a good place for cold then it'd be cold. Example of a cold moderate El Nino is 2009-10. Example of a mild but anticyclonic moderate El Nino is 1991-92. - Strong or very strong El Ninos tend to lead to zonal winters with mild and wet conditions on the whole. One such culmination was 2015-16 with that phenomenally mild December. El Nino Modoki (you can see above on what this type of El Nino is) events (which is the expected El Nino event for 2018-19 currently) tend to favour anticyclonic and cold Winters with wind coming in from the east. 2009-10 was also an El Nino Modoki and in fact, this was the last El Nino Modoki event we had. Historically, moderate El Ninos and weak La Ninas are your safest bets on a cold Winter for ENSO but there are deviations as with everything. ENSO neutral also can be good but there are far too many odd ones out in that case. So in summary, the type of El Nino that is expected (at the moment) is a moderate modoki event for 2018-19 which can be a good combination for a cold Winter especially with low solar activity and other things. What's also funny about 1994-95's El Nino was how it was El Nino Modoki instead of classic El Nino. So right now, we're in ENSO neutral and times are passing on the chances of this becoming an El Nino event. UK Met Office Glosea5 in its August 2018 update is depicting El Nino (fairly weak) for 2018-19 as well and specifically, El Nino Modoki (see posts above on explanation of the difference between a classic El Nino and El Nino Modoki). During the super El Nino events of 1982-83, 1997-98 and 2015-16, we were already in El Nino threshold (0.5c or above) by March-April-May 1982, April-May-June 1997 and October-November-December 2014 respectively. The latest tri-monthly period (May-June-July) had an ENSO anomaly of 0.1c which is textbook ENSO neutral and it's getting very late for El Nino to take place especially to what the CFSv2 is depicting. ENSO can happen late like 1976-77's El Nino did not begin 'til August-September-October but you can't help but feel extremely dubious with what the CFSv2 shows. As shown by the subsurface temperature anomaly profile below in the Equatorial Pacific, there is quite a bit of warm water waiting to be filtered up to the sea surface but recently at the end of July over towards the eastern subsurface equatorial Pacific, some cooler waters have started to appear. Will these enlarge and make El Nino near impossible to occur or will they promote the likelihood of El Nino Modoki? We'll have to wait and see. We're awaiting on the ECM to update for August 2018 to see what it shows for ENSO this time around. Last month, it was going for a weak to moderate El Nino Modoki. Last but not least, here's the latest sea surface temperature anomaly map from NOAA and the equatorial Pacific doesn't look particularly favourable for El Nino with a mix of cool and warm waters over the region. Quite a strange situation with these models depicting El Nino yet the signals from the Pacific itself don't look favourable for El Nino. If you click the play button on this graphic which gives you a timelapse of global SSTs throughout the month of August, you can really see the Modoki developing - select "SST Anomaly" from the dropdown menu. You can essentially see cool eddies appearing in the East Pacific and slowly propagating westward, while the Central Pacific becomes exceptionally warm and the Western Pacific remains generally neutral to cool throughout. I strongly suspect that this pattern is what's causing the previously low-forecasted Atlantic hurricane season to ramp up so much according to next week's model runs. You can see this with how many Eastern Pacific storms are surviving well into the Central Pacific and maintaining hurricane status while doing so, an unusual phenomenon - not good news for Hawaii going into Autumn I'd imagine. They had a very lucky escape with Lane.